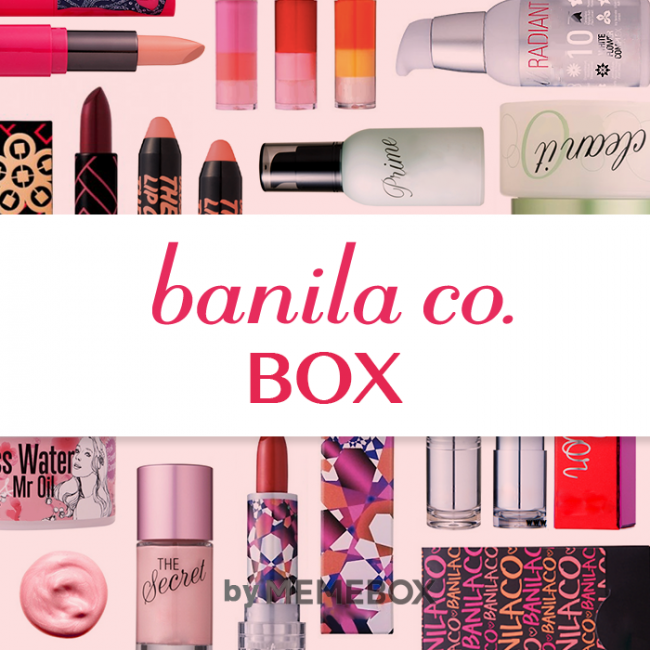 i love beauty boxes: Memebox Superbox 69 Banila Co. This box was selling for $32 plus shipping. Total value of box: $93. "High quality, high performance, beauty essentials: We’re shooting for the classics. Approved and endorsed by Korea’s top idol group member, Girls Generation’s Jessica, Banila Co. is certainly one of Korea’s top-selling, most-loved cosmetics brands! Everything from skincare to makeup, Banila Co. is infamous for its high quality, high effectiveness, and pinchably cute packaging. So, get ready to rethink the way you beautify with this impeccably curated Banila Co. Box! Enjoy it everyday, in every way!" Memebox Product Description: "This makeup remover goes on as a sherbet-like balm and transforms into a silky oil that effortlessly dissolves makeup and sunscreen. Its non-greasy, gently formula made from papaya, acerola, and herbal extracts cleanse thoroughly without dehydrating the skin." How to Use: "Take out the formula with the spatula and gently massage into skin. rinse off with water or wipe away with tissue." This looks like a solid mass, but when you dig into it, i's soft as butter...and as soon as it hits your face, it melts in to oil...just as described...I think I'm in love with it..This may replace my bottle of oil cleanser soon...Being solid makes it less messy, but it just requires a spatula. It has a really nice light fragrance. This is something I would definitely buy again if I run out. I"ll probably look at trying out the other different cleansers. Memebox Product Description: "A lightweight, smoothly applying pore-refiner that enhances the skin's uneven texture and primes the skin for makeup application. The Prime Primer Classic leaves skin silky soft and creates a protective layer over skin, allowing BB cream or foundation to glide on easily and last longer." How to Use: "Apply at the end of skincare routing and as a starter to makeup application to prepare teh skin texture for better make-up adherence." I opened up this primer to use right away. Since I was still working on using up my very first BB cream, the one I received from the first Banila Co. box, Superbox 7., I thought it would be suitable to try a primer of the same brand. This product comes out as a translucent lotion and glides on as smoothly as described (Note: my bottle didn't have the tube inside, and I had to turn it upside down to pump the product out..not sure if that's how its meant to work). My first reaction was that I really liked it compared to the other primers I was using (colourless and fragrance-free). However, after a second use I did get one small pimple on my check. Okay, one small pimple is not a big deal, but my skin as been acne-free since the birth of my daughter, so it was a bit concerning to me. But I have to admit that it may have been a result of me not washing my face until very late at night (after putting said daughter to sleep, falling asleep, and waking up at 3-4am realizing I haven't washed my face of makeup). I still have this on my shelf, and will give it another try. Memebox Product Description: "Containing 100% natural mud extracted from the mineral-rich Dead Sea, the Claypatra Facial Scrub is the perfect peeling scrub for exfoliating away dry patches, dead skin cells, and skin impurities. It will leave skin smooth, translucent, and firm." How to Use: "Spread the facial scrub evenly over clean, dry face and massage on to skin in a circular motion. Rinse off with lukewarm water. Its' recommended to be used 1-2 times a week." I finally used up my very first tube of peeling gel recently, the Swanicoco Cell Emotion Snail Gommage Peeling from Memebox From Nature. This one from Banila Co. is so similar to the Swanicoco one. It comes out as a white lotion and has almost the same fragrance and texture. It could easily be the same product in different containers..but that doesn't bother me..they both work the same and I'm happy with this new one. If you haven't tried peeling scrubs before, you should..I love it..I find it to be really gentle and effective in removing dead skin cells. A definite must have in my opinion. Memebox Product Description: "Create a dramatic to everyday eye makeup with this smoothly applying, waterproof, non-smudging, and long-lasting classic gel liner from Banila Co."
How to Use: "Take a small amount of the formula on the tip of the brush and draw in the lines along your lashes." I've yet to try a gel liner from Korea. This will be next on my list. Too bad it doesn't come with a brush. Memebox Product Description: "The blend of argan oil and coconut seed butter delivers instant glow and volume to lips while the glam colors melt onto lips for a glossy, radiant pigmentation." How to Use: "Apply directly to lips, first filling in the inner lip contour and then lining the outer contour." Memebox Product Description: "A moisturizing tint balm enriched with vegetable essential oil and Vitamin E complex and works to soften and replenish dry, chapped lips with a lovely pink stain." How to Use: "Apply directly to lips as often as necessary. It's recommended to apply a lip gloss subsequently for adding more volume and gloss." Quite happy that I bought this box. Mainly for discovering a new cleaning balm and replacement peeling gel. Other than the bright pink lipstick, I'm pretty sure I'll be using all the contents of this box.